I picked up a few materials for embroidery - I already had a bit of a stash, but why pass up any opportunity to go to an art/craft store? - and set about teaching myself the craft. To be clear, when I say I “taught” myself, I mean that I just started. 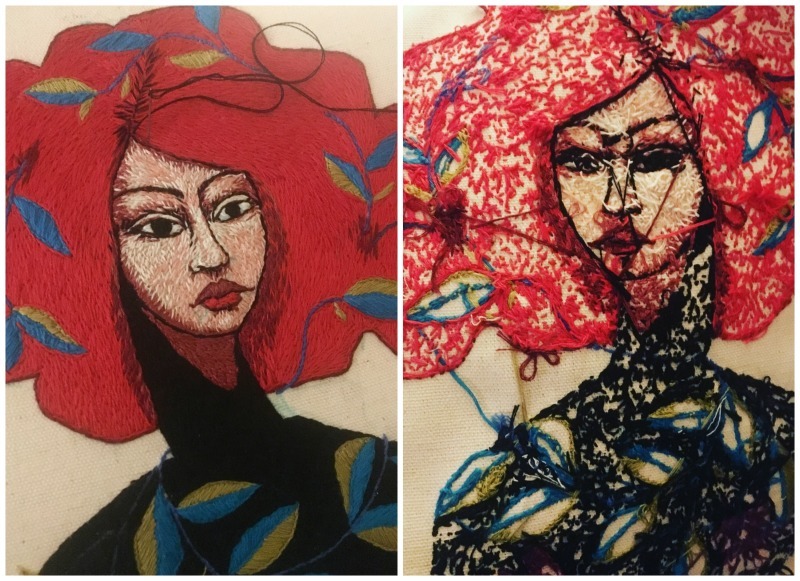 I played with different types of fabric, how many strands of embroidery floss I used, what size of a piece to start with (I tend to over do things the first time out), and what type of imagery to use. I opted to not do a lot of research or even looking at the work of others at first our of fear that I would feel compelled to “do it the right way”. Instead, I jabbed and stabbed and tangled and threw a couple things away. The result is a couple of big hair ladies that took a ton of time, but I learned a lot and am itching to do more. Stay tuned. This was my first portrait and I’m still trying to figure out how best to finish each piece off. Now that I’ve tried a few things on my own, I’m out researching and discovering others who are using embroidery in a fine art fashion. I’ve been particularly inspired by the likes of Kate Walsh of Fearsome Beast and Cayce Zavaglia.